Hybrid accretion is suggested to (only) occur at the inner edge of an accretion disk, against the magnetic corotation radius of a solitary star, forming terrestrial ‘super-Earths’, where ‘super-Earth’ will be defined as any planet formed by hybrid accretion, regardless of its actual size. The accretion disk, in which hybrid accretion occurs. may be a protoplanetary disk or may be a secondary ‘debris disk’, where the secondary debris disk may form from the ashes of a binary stellar merger (or perhaps from the ashes of a nova or supernova). Secondary debris disk hybrid planets, however, will typically be diminutive in size and solitary, rather than forming in multiples, as protoplanetary ‘cascades’ of super-Earths. Our former binary-Sun is suggested to have precluded the formation of classical super-Earths from the protoplanetary disk in our own solar system; however, Mercury is suggested to be a diminutive ‘super-Earth’ formed by hybrid accretion of asteroids condensed by GI from the solar-merger debris disk at the Sun’s greatly-expanded solar-merger magnetic corotation radius, near the orbit of Mercury. Then over time, the terrestrial planets (Mercury–Mars) ‘evaporated’ the leftover rocky-iron asteroids into the relative orbital stability of Jupiter’s inner resonances (or sent them careening into the Sun), including the largest rocky-iron (magnetic corotation) asteroid, 4 Vesta. Less volatilely depleted chondrites presumably condensed in situ against Jupiter’s strongest inner resonances from the solar-merger debris disk, and likewise still-less-volatilely-depleted (hot-classical) Kuiper belt objects presumably condensed in situ against Neptune’s strongest outer resonances. Super-Earths often form in groups or ‘cascades’ in low hot orbits around their solitary progenitor stars. In super-Earth cascades of 3 or more planets, the separation between the outermost two planets will typically be wider than inner separations, presumably indicating that the outermost planet of the cascade had less of a ‘heavy lift’ burden in clearing its orbit of leftover planetesimals. 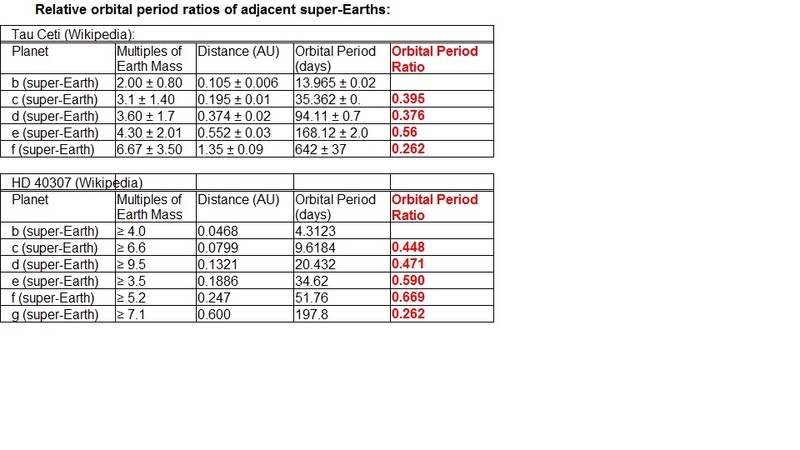 Cascades of super-Earths tend to exhibit adjacent orbital-period ratios of 2:3 (.666) to 1:3 (.333), except for the outermost orbital-period ratio, which is typically smaller. 2) next-generation planetesimals sequentially condense against the outer resonances of the previous super-Earth. Either way, super-Earth cascades form by hybrid accretion from the inside out, with the innermost super-Earth as the oldest and the outermost as the youngest. This alternative would require a stupendous heavy lift, as the first forming (innermost) super-Earth would have to clear its orbit of 5 or 6 times its own mass of planetesimals, in the case of exoplanet systems with a cascade many exoplanets, such as Tau Ceti (5 super-Earths) or HD 40307 (6 super-Earths). This mechanism might be suggested if exoplanet masses decreased from the inside out, but the reverse is true, that exoplanet masses increase from the inside out. This mechanism has other problems caused by scattering by the previous super-Earth, particularly since scattering would tend to preclude quiescent conditions necessary for core accretion and tend to create increasingly disorderly super-Earth orbits as a cascade grows in number, due to increasingly chaotic scattering with each progressive generation super-Earth within a cascade. In this alternative, the formation of each super-Earth in turn within a super-Earth cascade would disrupt the inner edge of the accretion disk, pushing it out as far as its outer resonances, where next-generation planetesimals could condense by GI. Thus, planetesimals condense against the magnetic corotation radius of a young star and hybrid accrete to form a first-generation super-Earth. The first-generation super-Earth disrupts the inner edge of the accretion disk as far out as its outer resonances, where second-generation planetesimals condense against the outer resonances and hybrid accrete to form a second-generation super-Earth, etc. The second alternative appears to solve the ‘scattering problems’ of magnetic corotation radius only planetesimals, so next-generation planetesimals condensing in outer super-Earth resonances is the suggested mechanism for the formation of cascades of super-Earths in low hot(ish) orbits.